An Edgartown retreat gets a modern refresh when a daughter takes over her parents' summer home. Built in the early 1980s in Edgartown—one of Martha’s Vineyard’s alluring enclaves—this home served as a haven for the current owner for countless summers while she was growing up. In 2016, she—herself now a mother of four—and her husband purchased the property from her parents. “They [the current homeowners] loved the house: It held so many memories. But it really needed to be updated, as there was too much of that late 1970s, early ‘80s vibe,” says interior designer Sarah Scales, who came on board to overhaul the aesthetic. The damaged wood flooring in the main living room was replaced with an impervious vinyl flooring that has the look of light grey washed oak, while the exposed wood cladding on the soaring ceilings was kept intact. The kitchen layout mirrors its original incarnation, while the upper cabinets were removed. New custom oak lower cabinets fitted with aged brass drawer pulls from Rejuvenation give the space a more modern vibe. “It’s a beach house, so we wanted it to feel very bright and white,” says Scales. Walls are painted a true white, and the trim is a pale grey. Color (mainly shades of blue that resonate with the locale) is infused strategically and sparsely, with accent pillows and artwork. The backsplash tile behind the stove in the kitchen offers a vivid burst of aqua in a custom colorway, created by Popham Design via Ann Sacks. The dining room table is a restored throwback that’s been in the house for decades. Chairs feature reupholstered seats in ultra durable Sunbrella fabric, while a sculptural Dutton Brown chandelier feels of-the-moment with a dash of vintage flair. While the majority of the home’s new elements are budget-friendly, there were some splurges, including the custom herringbone sofas in the living room. “The sofas needed to really stand the test of time, so we spent more money on them. We had them upholstered with Sunbrella fabric to ensure that they aren’t going to fade from all the sunlight that beats into the space,” says Scales. While the color palette is neutral, multiple textures give the home dimension. The sofa fabric is paired with a drum-shaped Anthropologie coffee table with a capiz shell finish, and atop the floor is a sisal carpet layered with a cowhide rug. Prints depicting marine motifs were scoured from online retailers, including Vintage Editions and Minted. “While we didn’t spend a ton of money, we wanted to make sure the house didn’t feel like it was filled with the homeowner’s parents’ leftovers,” says Scales, who strove to tailor the space to the young family’s lifestyle. An awkward closet with a bifold door in the living room was transformed into an appealing minibar with drawers, a wine cooler, and upper shelving. The wall behind the shelves is sheathed with a Schumacher wallcovering: Abstract Leaf in dove. The dated wood spindle stairway to the lower level, where most of the bedrooms are located, was reimagined with a steel handrail and cables along the sides, and has a much lighter, airy appeal. While the bedrooms didn’t have adequate subfloor to install hardwood flooring, the old wall-to-wall carpets were replaced with new, plush options. In some rooms, geometric, colorful area rugs are layered atop one another to bring in more texture. 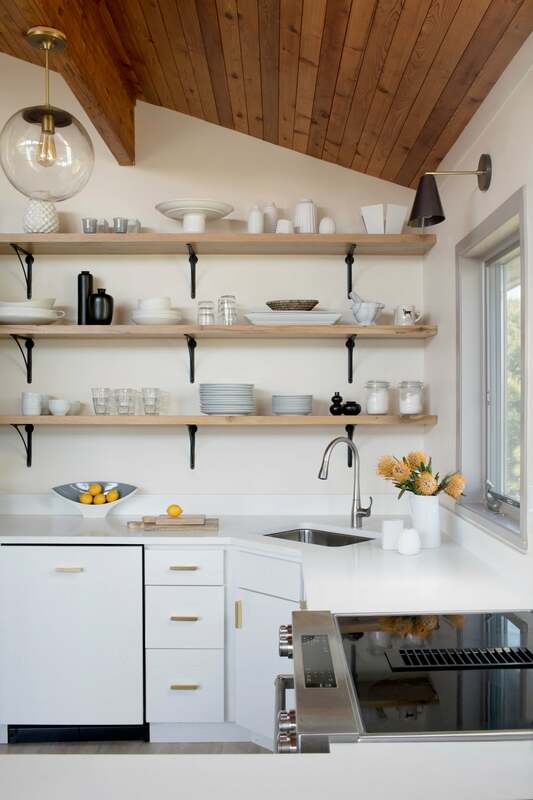 The house is undeniably the same place where the homeowner spent her youthful summers… but yet, it’s brighter, more relevant, and more finely-tuned to its modern inhabitants. Get ready for act two.